We are heading out on a family beach vacation in a couple of weeks and I’m so excited. We’re staying with friends on the Cape, and a big part of my excitement is rooted in starting traditions with Jane that meant so much to me as a kid. Some of my happiest childhood memories are from our family vacations to the beach. I remember spending the whole day in our bathing suits, with the salt water drying on our tanned skin as we played in the sand. I remember they joy of outdoor showers, and heading into town for ice cream cones after dinner. I have also been recalling some memories of what vacation must have been like for my mom, since this will be our very first beach vacation where I’m now the mom! Among my vivid memories of beach days and cool Cape Cod summer nights, I also have a pretty clear memory of my mom doing a lot of work to get us there. In the excitement to get out the door and onto the beach, I remember my mom standing in the kitchen of the summer rental house making each of us our sandwiches to bring for lunch. My siblings requested no condiments, I requested extra mayo and extra cheese (I still do, ha! ), and my dad would likely get a little bit of everything on his. Chips and drinks and sandwiches all got thrown into the cooler and we were off to make some summer memories! I’ve got the mom hat on now, and have some trial runs under my belt for beach picnic meals since we live close to the ocean. 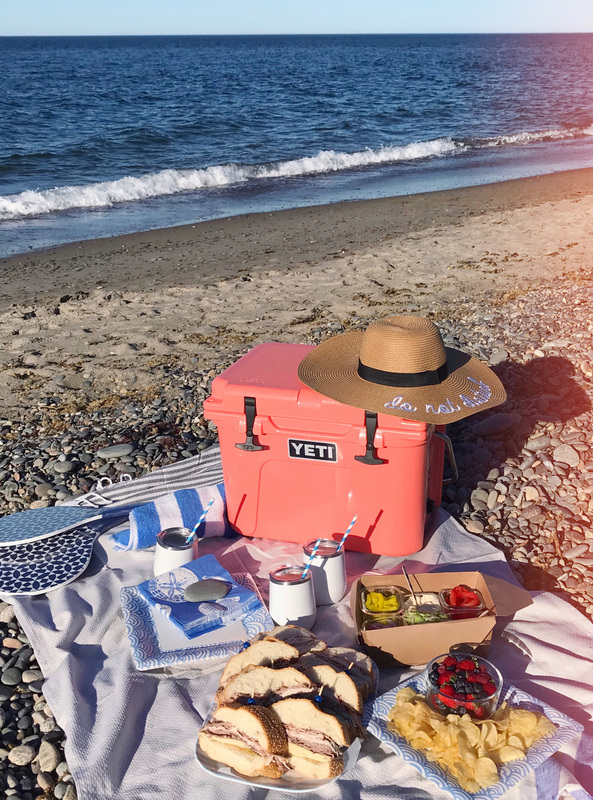 Packing a good beach picnic is an art form, a delicate balance of meal-prep and keeping things from getting soggy in the cooler! 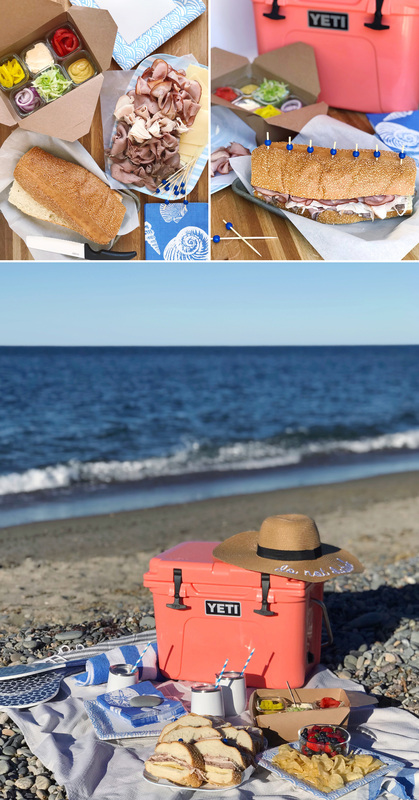 I have a trick up my sleeve for the latter that I thought I’d share with you today – it’s my beach picnic traveling party sandwich bar! Sounds fun, right? Here’s how I do it: I make one giant sandwich on a big loaf of seeded Italian bread. The sandwich is filled with a little bit of everything – I use delicious, quality deli meat like McKenzie’s Deli Turkey, Artisan Roast Beef, and Black Forest Honey Ham (which you can find at Shaw’s stores locally). Each ingredient adds its own distinct, authentic flavor! I pick a cheese that everyone can agree on – McKenzie Vermont Raw Milk Cheddar is a favorite. Then I close up the sandwich and place festive party picks down the center, and wrap the whole thing up to keep chilled in the cooler until we get to the beach. 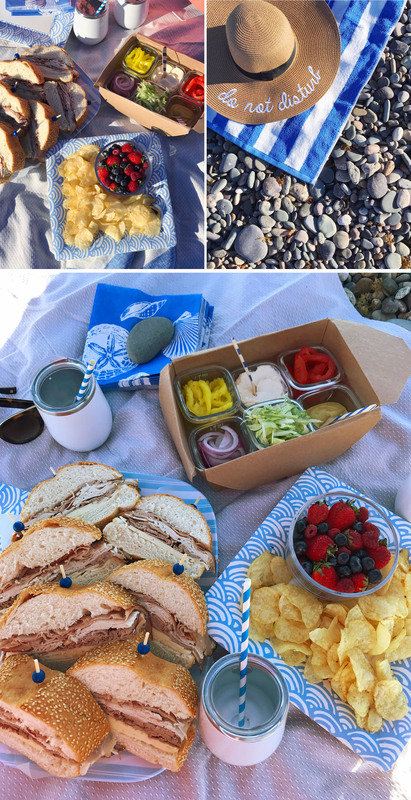 I pack up all of our favorite sandwich fixings on the side to keep the sandwich tasting it’s best when we unpack it at our picnic! Baby food containers are great for holding condiments, chopped lettuce, tomatoes, onions and peppers. I also use compostable paper takeout containers to hold all of the topping jars, fill another one with chips, and pack some sweet fresh berries for dessert! Then we’re off to the beach. When it’s lunchtime, we unwarp slice off pieces of the sandwich. Then everyone can add their own toppings and enjoy the delicious McKenzie Deli sandwiches just how they like it! 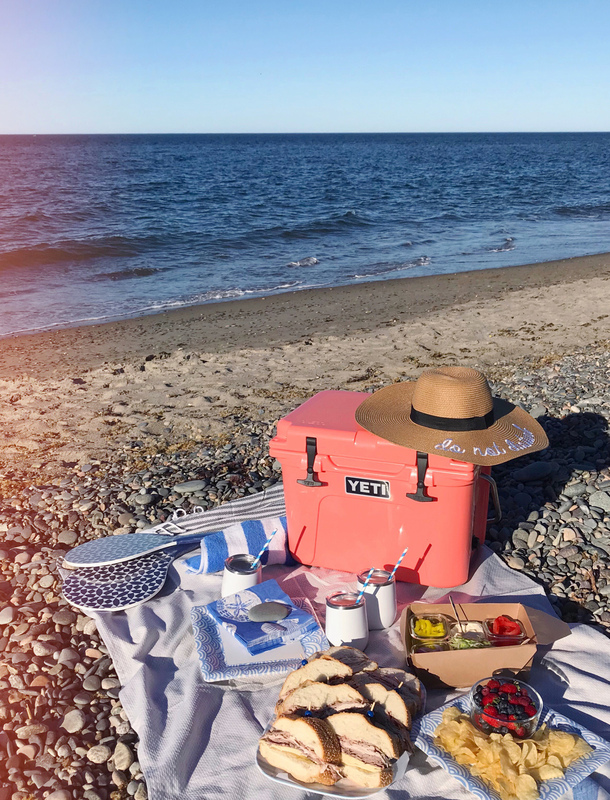 Here is the very best news of all — I am SO excited to be partnering with McKenzie Deli to give one of my followers everything they need for a beautiful picnic lunch on the beach! Head over to my Instagram page today to enter to win a YETI Cooler (in coral pink!) 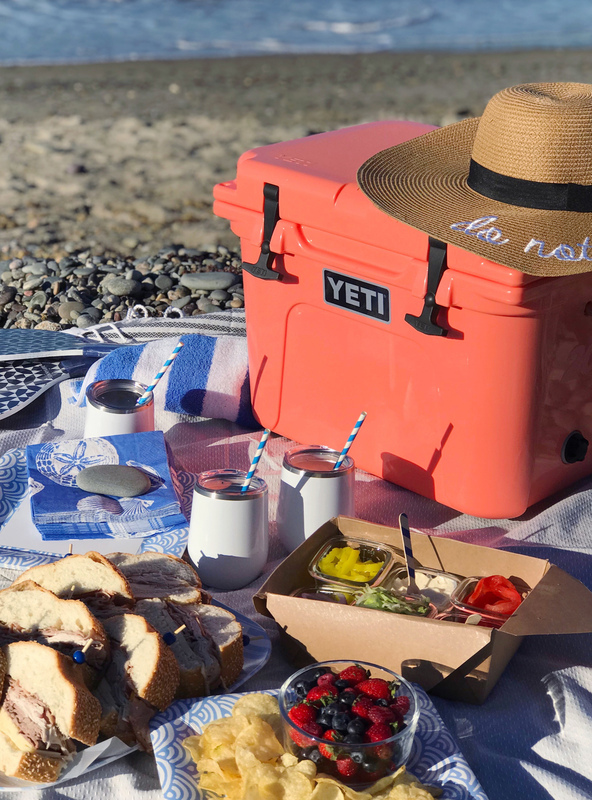 filled with $200 worth of my favorite beach picnic accessories including beach games, towels, wine tumblers, nautical party goods, and a festive sun hat. If you win, please take some pictures, because I’d love to see how you picnic with all of these fabulous treats! A Sparkling Pomegranate Berry Mocktail. 4th of July Entertaining Ideas. 2 Responses to "A Beach Picnic Giveaway." This is an amazing giveaway! Thank you for your generosity!